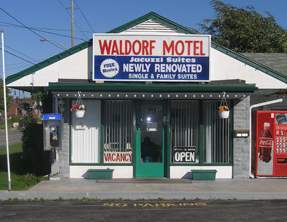 Clean and affordable motel accommodations can be found at the Waldorf Motel in Niagara Falls Ontario. This motel is ideally located in the heart of the city, only a short drive to the Casino Niagara, Clifton Hill and all the fun and excitement near the Falls. The Niagara Falls Waldorf Motel offers all types of travelers with great motel amenities, including Internet Access, Family Suites, Jacuzzi suites, free parking and smoking and non-smoking rooms. The Waldorf Motel in Niagara Falls, Ontario Canada has an excellent location, just minutes from Niagara Falls and major attractions. The Niagara Falls Motel is ideal for both, families looking for fun, and for couples looking for a romantic getaway with Jacuzzi suites and rooms with kitchenettes. It offers clean, comfortable, and affordable accommodations and is open all year round. All rooms are located on the ground floor with convenient, free parking right outside your door. Amenities include: central heating, individually controlled A/C, cable TV, fridge, microwave, and wireless internet service. The motel is family-operated and offers a friendly atmosphere. The Waldorf Motel is sure to satisfy your requirements for a memorable holiday experience.